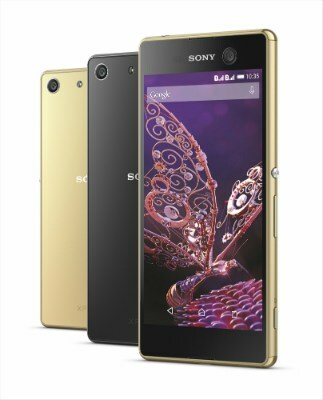 Sony India has launched Xperia M5 smartphone targeting young Indian consumers.The device focuses on the importance of camera capabilities which is very demanding now a days because of selfie trend among the people.Xperia M5 features Sony’s design with the OmniBalance style in a sleek glass finish on both sides. It is also designed for durability with stainless steel corners to protect against bumps. It has an 21.5 MP rear camera,5x Clear Image Zoom allows you to get close without losing any quality. With a 0.25-second Hybrid autofocus, The new Hybrid AF technology packs in both Phase Detection AF and Contrast Detection AF.It can capture videos in 4K.Xperia M5 has a powerful 13 MP front-facing ‘selfie cam’, which also comes with integrated autofocus and Full-HD video recording. It has a sharp, bright and vivid 5” Full HD display.Xperia M5 is also waterproof and dust-tight, with a capless USB port for added convenience and easy charging. Xperia M5 integrates a 2,600 mAh battery, An 64-bit 2.0 GHz Octa-core processor powered by MediaTekHelio X10 with 3GB RAM provides performance and speed to optimise your battery life. Xperia M5 also has an expandable memory with up to 200 GB uSD card and the device is available in the Dual SIM variant in India. Xperia M5 will be available at Sony Centers, Sony Smartphone Lounges and all leading retail outlets across India at the pricing of Rs 37,990.